With each passing year, new mobile apps are developed with latest technology integrated in them. App developers are racking their brains to introduce innovation in every phase of the apps that they develop. Improvements in smartphone technology and fast internet access are resulting in people spending an increasing amount of time online these days. The latest technology trends, security updates and trending programming languages are giving mobile apps new character. 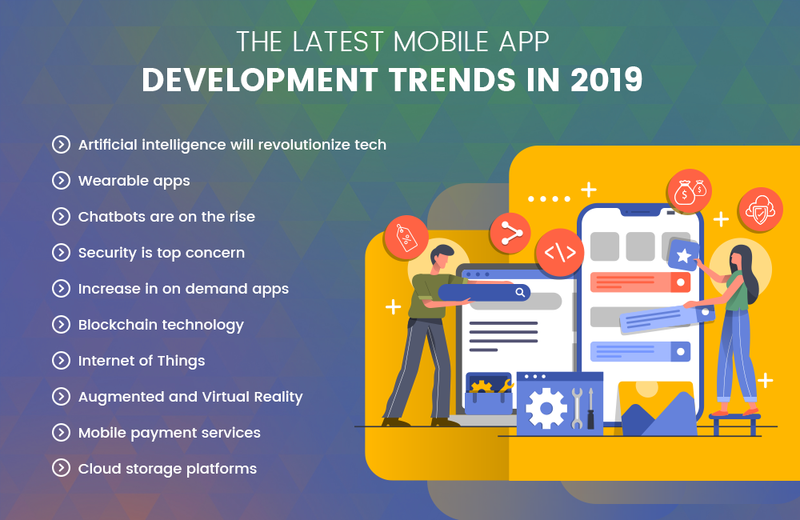 2019 marks the beginning of popular mobile app development trends that are expected to dominate the technological industry. The latest progressions in the field of Artificial intelligence will change the way we interact with mobile apps. Virtual assistants like Siri, Cortana and Google Assistant will now help us gather information, book an appointment, optimize productivity, or organize schedules. The International Data Corporation predicts that the market for AI will grow to $40 billion by the year 2020. This clearly indicates the fact that a majority of the sectors are looking forward to integrate their systems with artificial intelligence. The medical and manufacturing sectors have made great strides in increasing the efficiency of their products or services by adding elements of AI to them. Tech giants like Google and Apple are releasing new AR demos on their latest devices. This proves that AR/VR is going to be a game changer in the near future. These technologies are predicted to be seen on social platforms for branding as well as targeting potential consumers with the help of ‘Beyond The Screens’ AR/VR apps. Social media platforms like Snapchat and Instagram have already released their AR filters that can convert a human face into different funny digital characters. Presently, most wearable gadgets are usually synchronized to smartphones. A forecast by CCS Insights, reveals that the number of wearable devices will triple, from 84 million units in the year 2015 to 245 million units in the year 2019. According to a report by Business Intelligence, the market of wearable will increase by about 35% in 2019. Smartwatches will not only enhance personality and style, but will also become a crucial device in many aspects. In 2018, medical facilities made the use of wearable apps popular on a day-to-day basis. They use these apps to collect important details like heart rate and blood glucose levels from their patients. Apart from the medical field, other sectors are also likely to introduce similar features. The popularity of smartwatches is set to grow to new heights in the market this year. This would result in the introduction of more apps that use impressive features that would work on smartwatches. Companies will integrate their services on smartwatches. Wearable apps will help you keep in touch with other activities without having to look at your phone. In financial terms, the wearable industry will be worth USD33 billion by the end of the year 2019. With so much demand for wearable gadgets like smartwatches, fitness trackers or wearable headsets, the wearable apps industry is set to inflate as well. In the year 2019, authorities on the matter predict that chatbots will take over more aspects of communication in the mobile app world. As it is very important to have human-to-human interaction in various fields, the need to have real time interaction between service providers and consumers will propel the use of chatbots. Chatbots are virtual assistants that substitutes and reduces that need for human-to-human interactions. The Chatbot market is expected to increase to 1250 million by the year 2025. Nowadays, chatbots are being connected with AR and VR technologies to offer business enterprises a digital weapon that gives them a competitive edge over their competition. They have played a crucial role in increasing customer relationship management to a completely new level. There is always a tendency for users to abandon mobile apps after a while. Many app will use chatbots to tackle this issue. As there are a number of companies that make a profit through consumer engagement, firms will compete with each other to launch unique chatbot applications. Mobile app security remains one of the top requirements in the year 2019. We have already witnessed the growth of encrypted messages, industries protecting user data, mobile browsers protecting user privacy, Google’s efforts to improve app permissions and other efforts. These are clear indicators of the need for app security. Improvements in the mobile security domain will take place in the year 2019, especially for apps that make use of payment getaways, privacy protection and data encryption. Can the app keep private data secure? Is it possible for someone to hack into an individual’s data that is stored in the app? How much data does an app need? Will these apps drain resources and slow down one’s phone? Can an individual’s data be misused? Mobile app development companies need to address these concerns if they wish to succeed. According to the Gartner report, the debate on security has shifted from being compliant, to adopting the right security measures in the year 2019. Mobile apps that can convince the users that they have taken care of their security can only succeed in this domain. One of the most important mobile app trends in the year 2019 is the increase in the number of on demand apps that allow one’s life to be hassle-free and convenient. Starting from food, to healthcare, delivery, beauty and travel – there is always a need for on demand apps everywhere. The growth of on demand apps has largely reduced the gap between service providers and consumers. This trend will soar in the year 2019, as more apps are introduced from every sector. It is said that 42% of the adult population have used at least one on-demand service. There is no evidence that this on-demand trend is going to fade away anytime soon. Although launched a few years back, blockchain technology created a buzz in the year 2018. When it comes to assets, most financial institutions and investors have reaped huge benefits from this technology. According to Transparency Market Research, blockchain technology is predicted to hit the $20 billion mark by the year 2024. For example, with the use of blockchain technology, it is possible to develop decentralized mobile applications. A Decentralized Mobile App is basically an application that is not owned by any individual, but is also impossible to shut down and so would not experience any downtime. In simple terms, Blockchain is expected to contribute more to the mobile app industry by enabling mobile apps to be decentralized. This clearly indicates the fact that an increasing number of mobile applications are set to find ways to profit from this technology, by using key methods adopted from the decentralised currency platform. The IoT is becoming an important part of our lives. Smart homes, smart devices, smart cities, and smart vehicles, are emerging as solutions that sit at the top of research and technology that aims at making our lives more comfortable and secure at the same time. With the increase in the use of mobile devices, most connected solutions tend to include a mobile app, or go for a mobile-first approach. For example – it is much more convenient to control your home from your smartphone. In this case, having a mobile app that helps you to do so is necessary. The development of IoT mobile apps will be among the top trends in the year 2019. According to an IoT report from GrowthEnabler, the Global IoT market has been growing at a CAGR of 28.5% since the year 2016 and will reach US$ 457 billion by the year 2020. Real time supply chain, smart healthcare and smart homes are not science fiction anymore. They have become a reality. With the increase in IoT devices and networks, the need for feature rich apps is also bound to increase. Augmented and Virtual Reality transforms the user experience in an app to make it much more interactive. From AR apps to social networks or apps for businesses, AR and VR have revolutionized the way apps function. This year will see further advancements in this technology, through app development. In 2019 Augmented Reality is expected to revolutionize app development trends in different fields like health, engineering, real estate, retail, and others. For example, an Interior Designer can start her own mobile application that asks a potential client only to upload images of videos of the property they need to upgrade. With the help of augmented reality, the app can give the customer a show of the property based on the specifications they mention. This is a win-win situation for both the designer and the customer. Here, the designer is saved from the pain of convincing the customer about the suitability of their selection. At the same time, the customer can also see whether their choices actually will or will not emerge into what they had wanted. Virtual reality is another mobile application trend in the year 2019. The term virtual reality has usually been used to describe simulations of scenarios that are difficult as well as expensive to create. Examples of these simulations are recognizable as simulations of outer space for astronauts, simulations of the anatomy of the human body for medical students, and other such examples. The Application of VR has also spread to businesses as it can help to recreate how a certain product would look to their customers. An example is certain applications that can show how a dress or jewellery like a pair of earrings, or a pair of shoes would look on you before you actually purchase them. As people prefer being online using their mobiles, businesses need to have their own mobile applications integrated with VR technology to provide their customers with these experiences. 2019 marks the year for the introduction of more of these applications. When you talk about mobile commerce, making payments through mobiles cannot be far behind. As people are more comfortable and confident making online payments, mobile application must combine multiple payment gateways. Any successful mobile app will have at least three or four methods of making payment. These would include credit or debit cards, mobile wallets, gift cards, and others. Many European countries are set to introduce crypto-currencies as a payment method by the year 2020. That means that including crypto-currency as a payment method is something that will materialize in the near future. In terms of mobile app development, in the year 2019 banking platforms will not lag behind. It is expected that the banking sector will introduce more mobile payment options in the year 2019. The rapid growth of digital services and ecommerce will pave the way for banks to develop convenient payment services for mobile apps. 2019 marks the increase in development of a number of apps for varied services and products. This can possible pose a challenge when it comes to storage space. Cloud storage is expected to curb this menace in this year. The integration of cloud storage platforms for apps will make security measures, as well as the management and storage of data, easier for businesses. Professionals these days make use of Dropbox, Evernote, Google notes at their work place. These applications are hosted on cloud platform that enable them to obtain their personal as well as professional data anytime from any location. When these apps were launched, there were several issues about their security and privacy. No one can pretend that these issues have been resolved completely. They are however, under much more control nowadays. So, their use has increased manifold. These changes also have an impact on the mobile industry as well. One of the most popular trends in mobile application development in the year 2019 is cloud integration for mobile apps. This development will ensure that the users across the world, receive a seamless experience. It will be helpful for organizations who are involved in training people as the trainees can make use of training material from anywhere in their own convenience. With more businesses trying to engage people, the integration of cloud solutions with mobile applications is expected to take a jump in 2019. To sum up, the integration of artificial intelligence, augmented reality and virtual reality technology will revolutionize the way apps are developed. An increase in the use of chatbots, wearable apps and on demand apps will also increase in popularity in the year 2019. Apart from these trends, the internet of things, reduction of security concerns, the integration of cloud platforms, block chain technology and mobile payment services will be among the most important app development trends for this year. If you are looking forward to develop an app for your business, opt to collaborate with a reliable mobile app development company in USA, as they employ experts who can harness the potential of the trends mentioned above while developing your app.